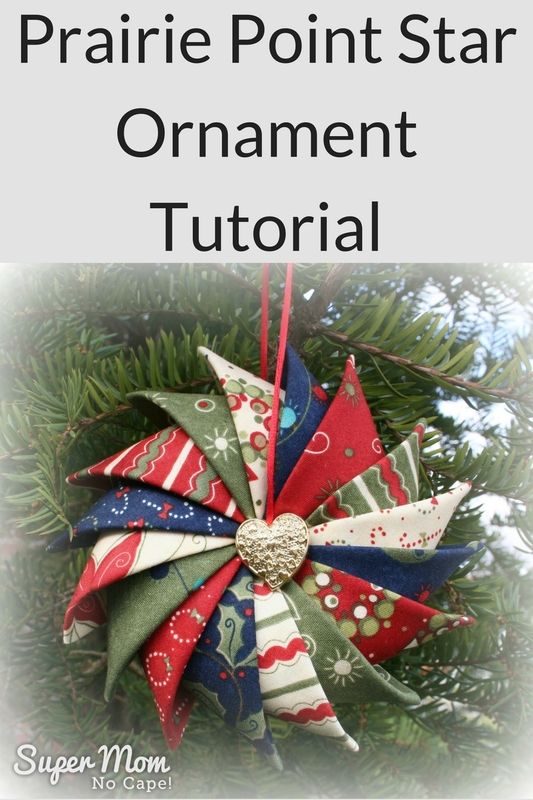 Whether you’ve arrived from Pinterest, CraftGossip, Total Tutorials or another of the wonderful sites that have linked to my Prairie Point Star Ornament Tutorial, I’m so glad you’re here! I’ll be sharing several fun, new tutorials over the coming weeks and months. 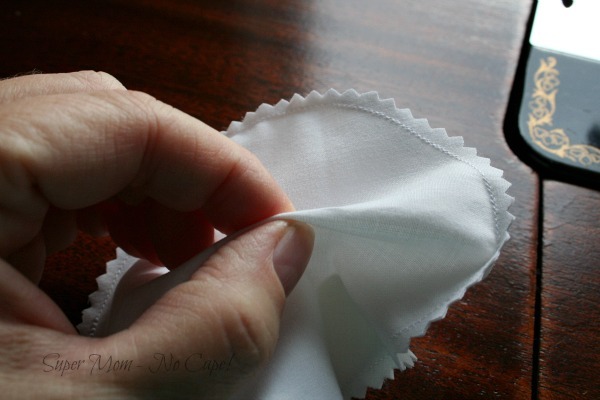 Fold the 5″X10″ scrap of fabric in half or if using 5″ squares, place one on top of the other. Use a compass (<-affiliate link) to draw a 4.5″ diameter circle. If you don’t have a compass, you can use the lid from a yogurt container as a template. Stitch completely around the circle following the pencil line. Use pinking shears (<-affiliate link) to trim the seam allowance. 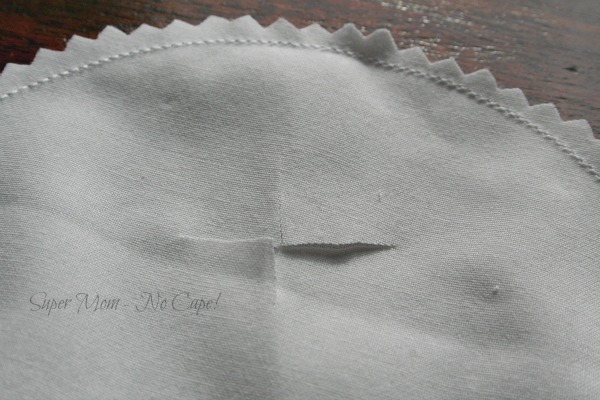 Alternatively, the seam allowance can be trimmed to 1/4 ” and notched as shown below. Pull the layers of the circle apart. Cut a small X in one side. 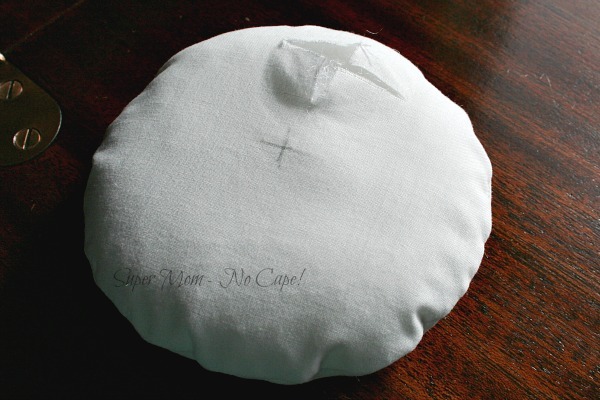 Avoid cutting the X too close to the center as you will be sewing through the center point several times. Turn the circle right side out through the opening. Mark the center point of each side. You want a flatish, puffed circle, not a round ball. It doesn’t have to look pretty. It just needs to hold the stuffing inside while you’re adding the prairie points. Set the stuffed circle aside. Divide the charm pack into colorways. 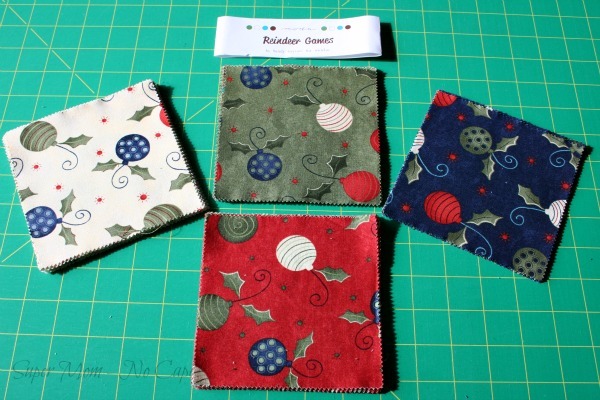 For this tutorial, I used Reindeer Games by Sandy Gervais for Moda. As there were four colorways, I chose 4 charms from each. 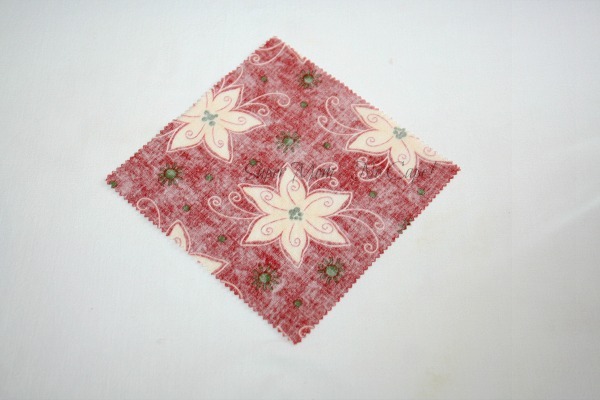 Place a charm square wrong side up on the ironing board. 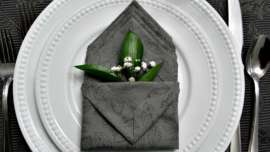 Fold it in half, opposite corner to opposite corner to form a triangle. Press. 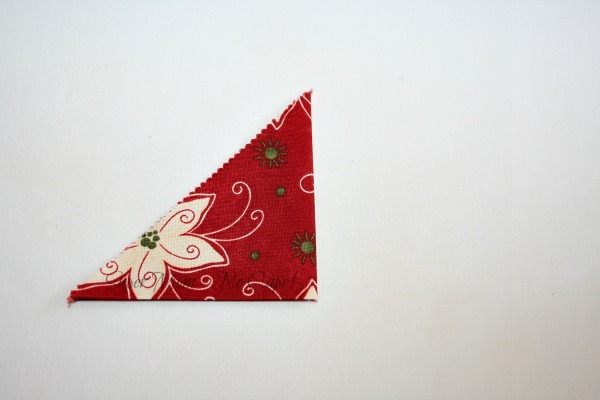 Fold the triangle, corner to corner along the folded edge to form the prairie point. Repeat for the remaining 15 squares. Thread the needle with about 30 inches of thread and tie a good strong knot. I found that a soft sculpture doll needle worked best, but these can certainly be made using a regular hand sewing needle. 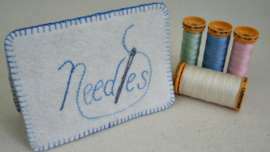 Insert the needle into the center mark on one side and draw through the mark on the opposite side of the stuffed circle. Place one corner of the prairie point on the center mark and take a stitch. 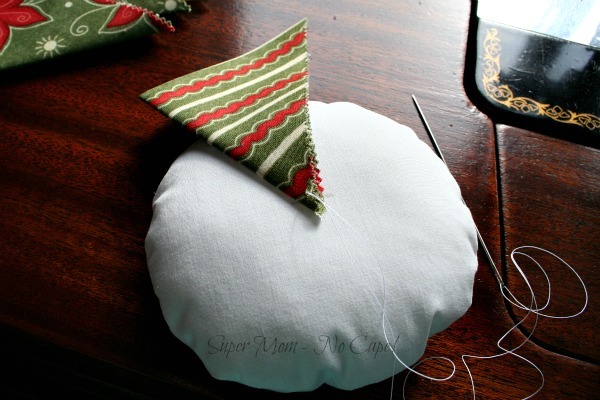 Make another stitch, pulling the thread through to the opposite side of the circle as demonstrated in the left photo below. 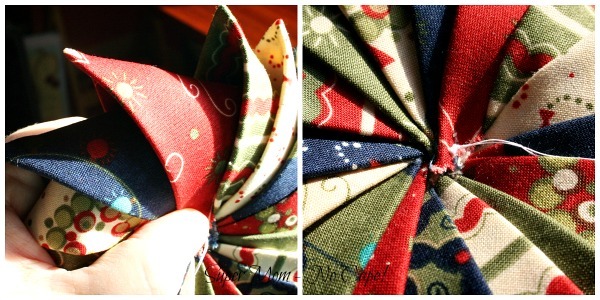 Fold the prairie point over the circle and take a stitch in the opposite corner. 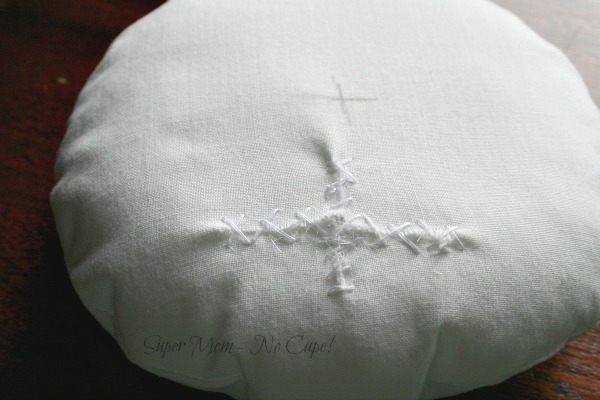 Secure by taking a stitch back through to the first side. Continue to add prairie points in this manner. 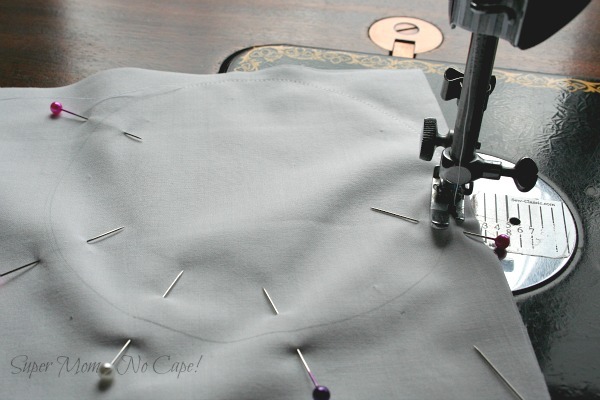 It can be a little tricky to sew that last prairie point in place as it needs to be tucked under the first prairie point. Once the final prairie point is sewn in place, secure the thread with a knot but don’t cut the thread yet. 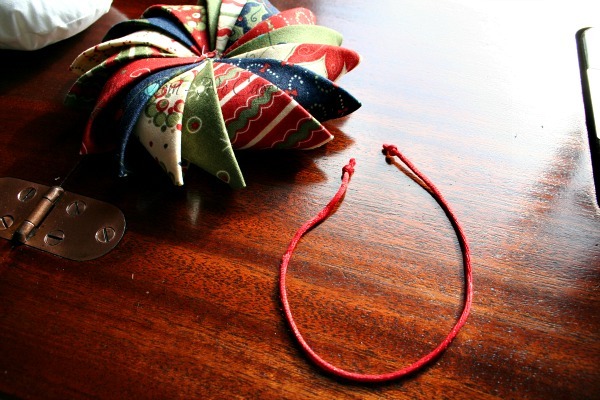 Cut a 12″ length of cording (or ribbon) to form a hanger. When using cording, I knot the ends to give me a larger area to sew through. 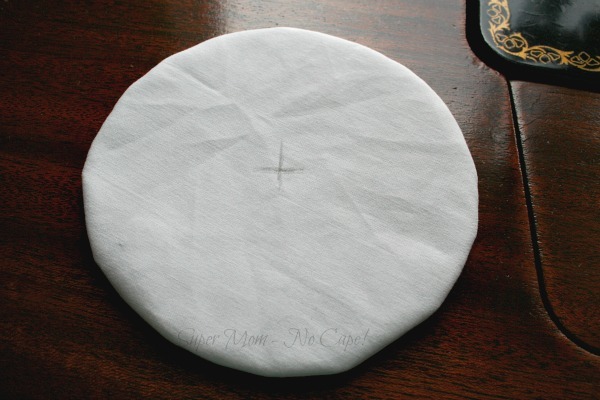 Sew the cord to the center of the circle. 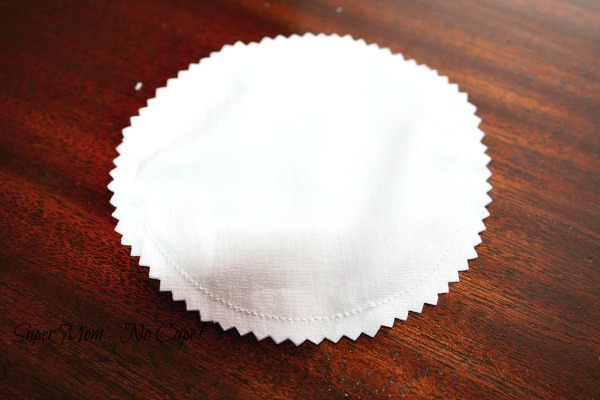 Sew a pretty button on each side. Secure with a knot and cut the thread. The finished size using 5″ charm squares is approximately 6″ across from tip to tip of the prairie points. 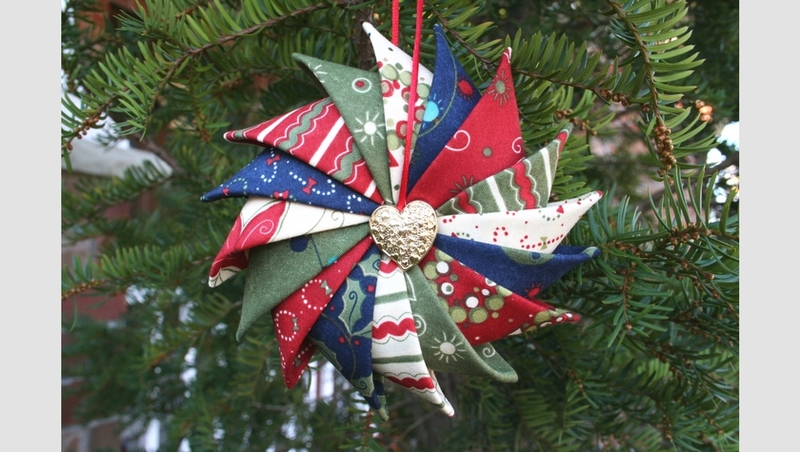 Prairie Point Star Ornaments can be made in a variety of different sizes and fabric combinations. In the photo above, the center one is the one made while creating this tutorial. 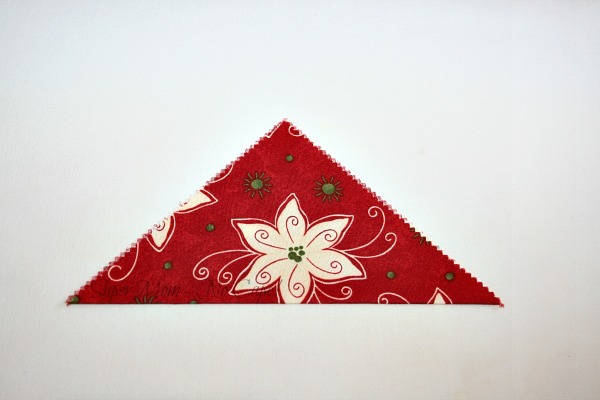 The red and white used 4.5″ squares while the green and white has 4″ squares to make prairie points. Changing the size of the ornament is easy. Simply decide what size squares to use to make the prairie points and cut the circle for the inside ½” smaller in diameter. 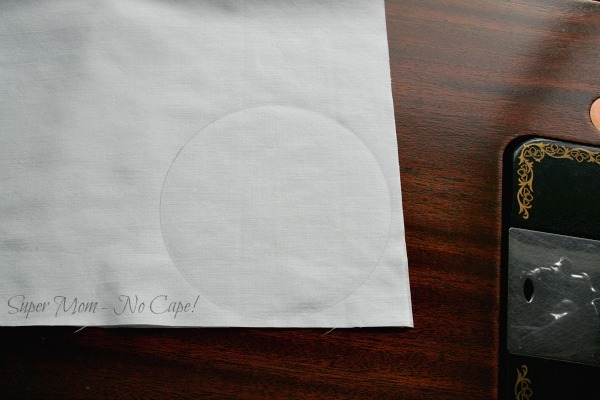 If you are cutting 4.5″ squares, cut a circle that is 4″ in diameter. 4″ squares would require a 3.5″ circle. The one pictured below is the first Prairie Point Star Ornament I made back in September. It’s made from leftover charm squares of Season’s Greetings by Sentimental Studios for Moda. These will all be beautiful additions to our collection of Christmas ornaments. I have more cut out to give as gifts. 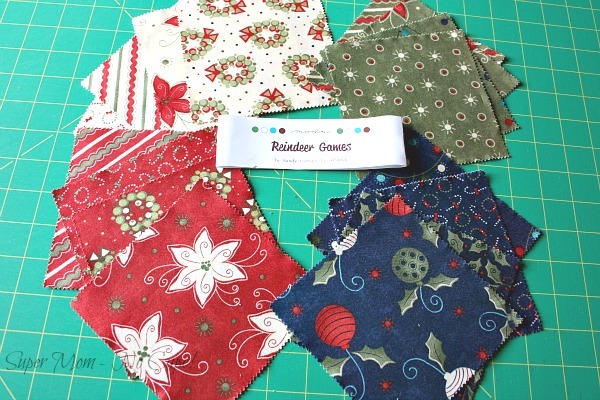 They are a great way to use up some of those charm packs or Christmas fabric in your stash! You can even make Prairie Point Star Ornaments for other occasions. I’ve made several Patriotic Prairie Point Star Ornaments to hang in our windows. At first I made them for the 4th of July but we loved them so much that I left them up year round. For those, because I made them in red, white and blue fabrics, I used 15 prairie points instead of 16. And for Valentine’s Day, I made Valentine’s Prairie Point Star Ornaments. As always, if you make something with one of my tutorials, I’d love to see a photo. You can either e-mail me by clicking on the little envelope in the upper left-hand sidebar. 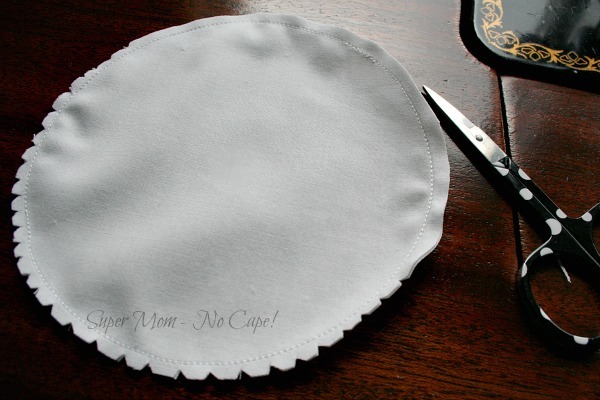 Or tag me on instagram @supermomnocape. 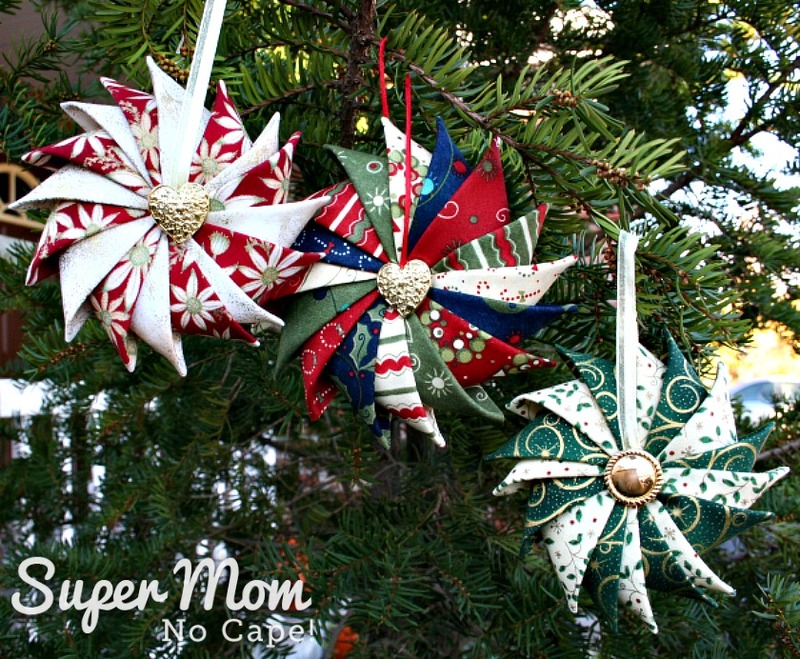 After you’ve made one (or more) Prairie Point Star Ornaments be sure to blog about it, post it on Instagram, Facebook or Flickr, then come share it in my Prairie Point Star Ornament Link Party! Your ornaments are gorgeous, Sue. Thanks for the great tutorial. Those look fantastic. Thanks for the fun tutorial. Thanks for sharing this lovely pattern. But I’m just a little confused – are the prairie points just stitched to the front of the puffy circle? If so, is the back uncovered? Or do they fold right around to the back? The tutorial is very photo intensive so it would be easy to miss that part of the directions. 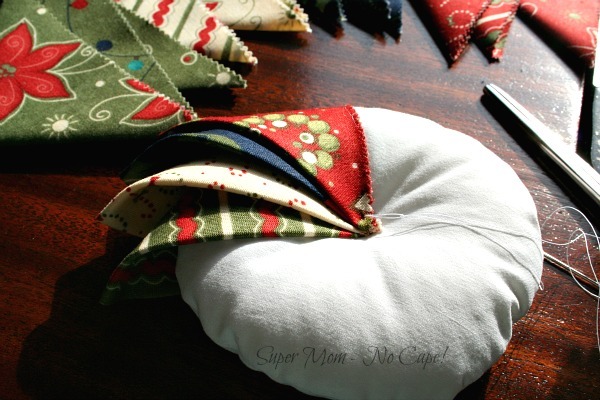 If you scroll down, under photo 20, the instructions say… Fold the prairie point over the circle and take a stitch in the opposite corner. Secure by taking a stitch back through to the first side. So the prairie points are stitched to both sides of the circle completely covering both the front and the back of the puffy circle. I’ve been anxiously awaiting this tutorial Sue! Your ornies are beautiful and I thank you for the fabulous tutorial! These look amazing – thank you so much for the tutorial. I know it took a lot of time to do this! Thank you for the great tutorial. I now have a use for my collection of Christmas charm squares. It’s charming, and the tutorial seems very clear. Thank you for this lovely clear tutorial, Sue. It looks absolutely super! Thanks for clearing up the step for photo 20. I didn’t get that either. these are so perfect as ornaments. Thanks for sharing with everyone. I missed it too. Thanks. Do you stitch the points together. looks like it one of the pictures. Love the idea. I will be making some myself. Great! I made one as soon as I saw the idea! It came out beautiful! Thank you for the holiday ornament!? These look fabulous. Definitely going to make these to add to my many handmade ornaments! Great tutorial. Made a sample ornament for myself tonight. Very easy. I showed my mom and she didn’t believe I had made it myself. I told her how to make it and she will be making some herself. I plan to make some as gifts for friends. What a wonderful thing to see hanging on a tree or perhaps in front of a window – I shall certainly give this ornament a go sometime soon – thanks for sharing all your lovely photo’s. Great tutorial. 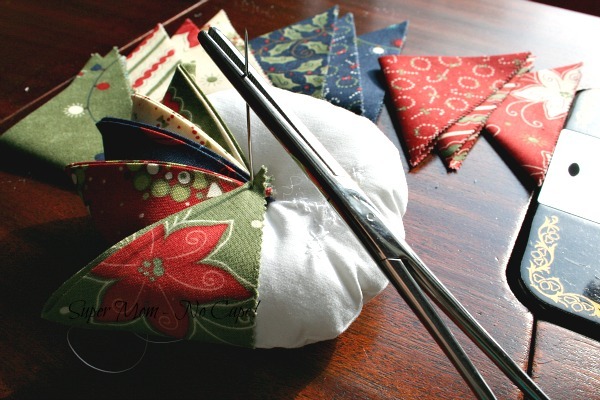 Great gift for a fabric-loving friend or anyone. 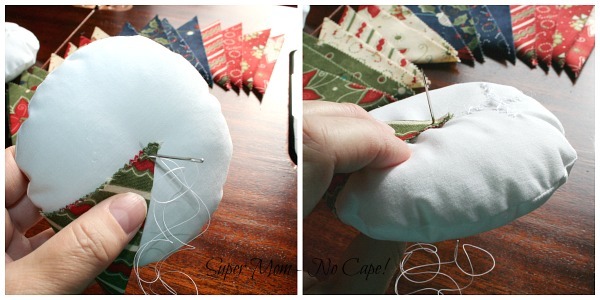 I will share this tutorial, with a link to your site, on my Friday Finds this week, Dec. 4th. Thank you; I can’t wait to make one! I love these. I want to make some!!! I had the same question as Jenny. I’m glad the back is covered, too. I love this ornament. I could use fabric especially chosen for the recipient, like Hello Kitty for a certain daughter. Also perfect for an ornament exchange at my guild. Thank you so much for the tutorial!! beautiful….I’m gonna make some right now…Love it! Thank You For The Tutorial. The Ordinate Was Great Fun To make. I do NOT know how I missed this post! I did, because there’s no comment on here from me, and I don’t remember seeing it, but this is the coolest thing ever! I must make one for my Secret Shoebox partner for next year. It’s fabulous! Thank you so much for showing how to do it. It looks pretty easy! Wow what a gorgeous ornament! 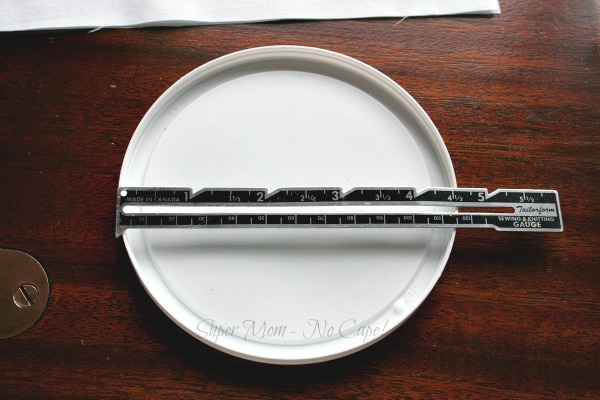 It looks intricate, but it’s pretty simple to make. Thanks for making this tutorial! Love the ornament, and just finished my first one. I would like permission to use this in a sewing guild program. Please contact me, as I can find no way to contact you directly. Thanks. I just recently found your blog via another blogger. Unfortunately, I can’t remember which one. 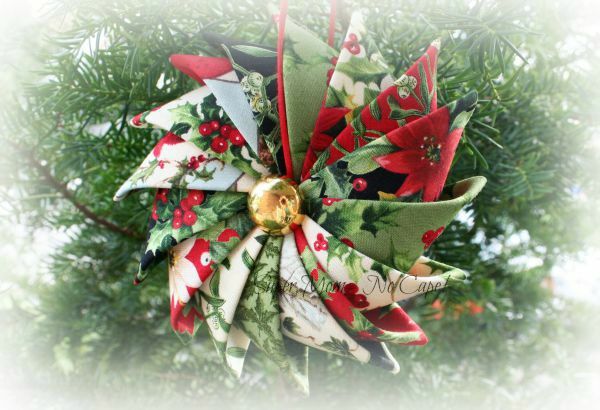 I really like this ornament and am going to attempt to make some for Christmas 2016. If I start now, I should be able to get some made. Thanks for this “complete” tutorial. Also, thanks for answering Jenny’s question as I was wondering that myself. Once you pointed out that it was in picture 20, I could see it. Even thought I had read it, it hadn’t clicked. I have subscribed to your blog. Thanks for sharing. I really like these ornaments. I am so glad i bought your prarie point kit at the quilt show in August at the church in Maine. Can’t wait to make some tonight. Thanks. I had a problem when making m8ne. The points don’t seem to look like yours. Kine looks moree like a round piece of candy. I made it with a 4 inch circle. Any suggestions. I sent you an email but wanted to reply here too. The coding on the Next and Previous buttons has been fixed. They should work fine now. quick question about spacing…about how far apart should the Prairie points spread from each other so there is equal spacing for all 16? super beautiful. thanks! I have had the worst time sewing on the buttons. Any tips or hints? I also tried bells & had a bad time sewing them on. I love them! They are beautiful! Would love to have this tutorial sent to me if possible. I replied via email but thought I’d reply here as well. The pdf of the Prairie Point Star Tutorial is only available to those who sign up through the links provided in Prairie Point Star Tutorial post. When you see Click Here… click on that and a form will pop-up for you to sign up. Shortly after you’ve signed up, you’ll receive an email with the link where you can download the pdf of the tutorial. 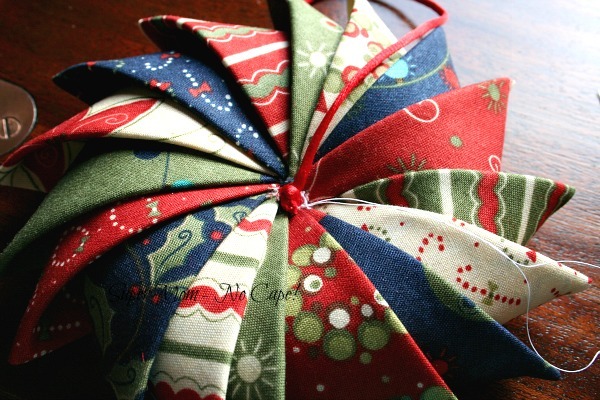 I love this idea of an ornament, but my questions is when you fold in half and then again, when you put it on the ball the raw edges are showing. Are they supposed to show or not? If not, what am i doing wrong? First make sure that you are working with each prairie point as a unit. Do not open them up after folding and pressing them. This is beautiful. Can’t wait to try it. Thank you for sharing your talent with like minded sewers. That is such a pretty ornament! Pinned. Went for coffee this morning and saw some ladies admiring a selection of these ornaments. The were so beautiful that I had to be nosey and have a look. I eventually found your site and can’t wait to get started (after I’ve finished my ironing). You are so talented. Thank You for sharing. Thank you so much Pauline for your sweet compliment! Have fun making the Prairie Point Star Ornaments! I’ve sent you an email but I’ll reply here too. Where did you add you email address? Did you add it to the little window that pops-up when you click on the link in my post? Or did you add it somewhere else? In order to receive the Prairie Point Star Ornament pdf, you have to sign up through the little window that pops up when you click on the link in my post. Once I know how you signed up, I’ll be able to figure out why you didn’t receive it. I was able to check the records for my email provider. And I think I know what happened. You had signed up to receive the pdf of the Prairie Point Star Ornament in October of 2016 and then a few months later, you unsubscribed. When you resubscribed/signed up again using the same email address… it didn’t trigger the send function for the delivery email because it’s set up to only send that email once to each address. And since you’d already received it once last year, it didn’t send it again. I’ve sent you another email with the link to the download page. This is beautiful. 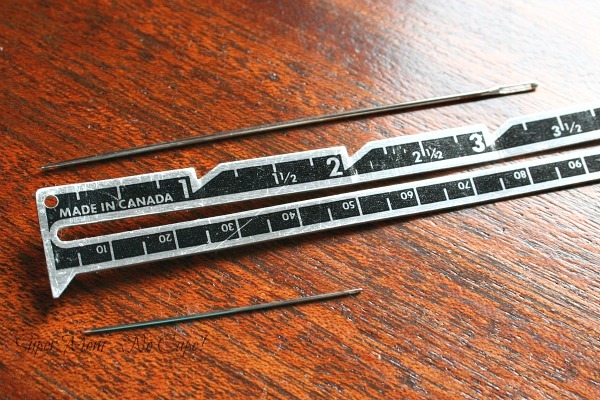 I found that if I threaded all the points on the needle at once and just went through the cushion once with all of them, it was much easier to do. I have arthritis in my hands and found it quite difficult to keep going through all that fabric. Once one side was done, I just turned it over, and repeated on the flip side. Thank you Debra. I’m so glad you like it. 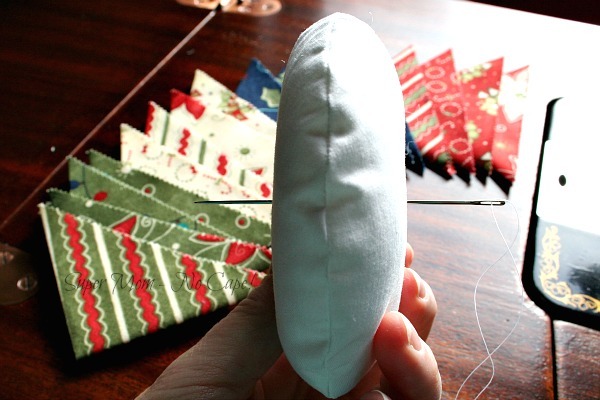 It can be difficult to keep pushing the needle back and forth through the stuffed circle. So I’m glad you found a solution that works for you. Please be so kind as to email me the PDF instructions for the prairie point Star. I’ve been on holiday but am taking time today to catch up replying to comments. I keep trying to get the tutorial but it does not come through on my e-mail. According to my records you were sent the email with the link to the download page. Did you check your spam folder to see if it went there? In any case, I’ll send you another email with that link. Love this, looks easy enough for young children, I was a bit confused regarding the other point, but read it more slowly and understood. Thank You, Great instructions. Thank you for your lovely compliment LJ! I’ve never tried making an ornament like this. Very unique and pretty. I love your Prairie Point Star Ornament! Do you have the option to download the instructions? 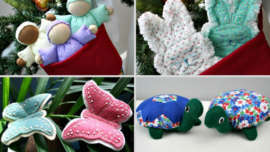 I would love to make them as gifts for my family. please add me to your subscribers member list. The pdf for the Prairie Point Star Ornament is currently unavailable as we are making some updates to how we deliver our tutorials. It will be available again soon. Sorry for the inconvenience. I love this! Can it also be enlarged to make a door wreath? Hello Peggy… I’ve never tried to make one large enough for a door wreath. It couldn’t hurt to try. Just wandering, do these look the same front and back? Yours are beautiful! Has any one tried using a layer cake maybe that would make a cute door wreath!